Shrunken Heads are great! 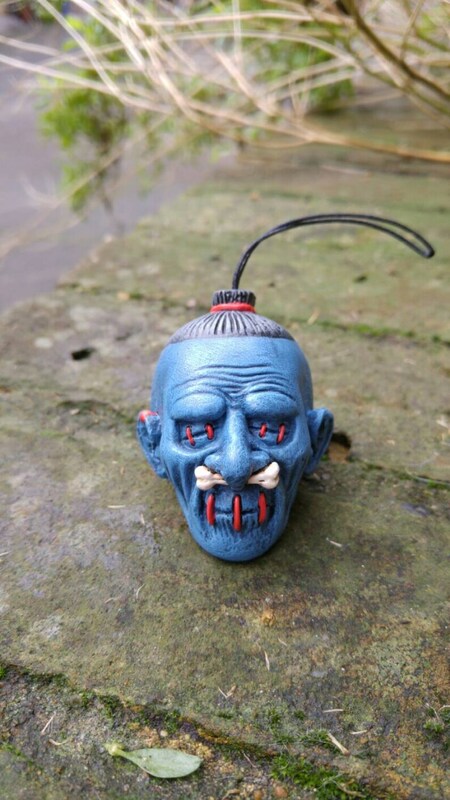 In fact, we think they're so great we made three different colours of shrunken heads but after GREAT public pressure we decided to release some extra colours. This is the first of three brand new colours! These nifty decorations are made from a ceramic polymer, so are sturdy and hardwearing . Can be used as car mirror decoration, rope pulls for the bathroom/kitchen/boudoir, they'd look AMAZING in your tiki bar, can be used as a stick incense holder (if you remove the string) or just sitting on your bookshelf being awesome. Trust me, you can't live without one of these! This listing is for the purchase of ONE (1) Shrunken Head Dangler. Limited edition of 75, this is the Blue variant.